Um…I heart you…these photos are STUNNING…that chair…I want to eat it…and all the other stuff I told you in private that I will deny. I love you gorgeous woman. Kims last blog post..House M.D. Can I borrow him for a minute? I think every girl needs a cousin like Jaush. Wow!! I need a Jaush. Sherendipitys last blog post..Nablowme Fodder: Meme 3 things…. You look amazing! And congrats on the calendar! Wow. You look gorgeous. Is he for sale? At least lease? I love your hair, and look how he made your eyes POP! Can he come up to SF and be my makeup artist? Also, I moved from NY to CA earlier this year, and my skin STILL hasn’t recovered. Unbelievable. I’m green with envy. But you’re so pretty anyways. Wow! We need more pics. How fun! But Casey when all is said and done the most beautiful part of those pics is your eyes and Jaush had nothin’ to do with makin’ those. i need a Jaush and his box full o’ MAC. I would trade all 25 of my cousins for one of him. You look amazing. Congrats on the calender. 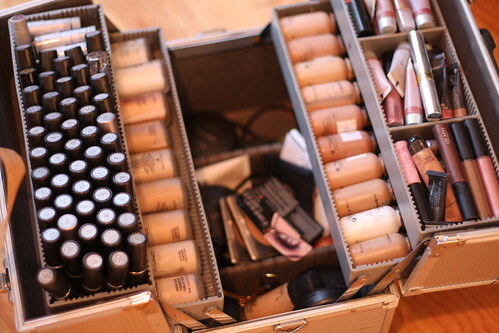 If someone cracked open a trunk of all that gorgeous MAC makeup in front of me – my first response would be, “Well, hello gorgeous”. You look gorgeous! Is your cousin a makeup artist? You are always beautiful first of all – second, I too would trade all my cousins for one like that. Also, I am in love with the dress and I’ve only seen the collar… you have to show us the rest! GREAT photo! Your cousin totally rocks. Nice! I think I love your cousin a little bit. Can we trade? My cousin has a cute kid. That is kind of even, right? I want a Jaush.. seriously anyone to make me beautiful with pretty clothes my size (which would be damn near impossible), I will even do without the diamonds and shoes.. puh-leaaase;) Enjoy your time out west – you got out of IN at the perfect time it’s flipping cold here!! I’m not a bit makeup girl, but I felt a little flutter at all of that MAC in one place. Mama loves some MAC. And your pic is stunning. Wow. I totally wish I had a cousin like that! I have a friend like that, who I used to live in the same house as, and he is AMAZING. But now we live in different provinces (Canada-speak for “states”) and I don’t get to see him or his wonderful make-up cases any more. I miss them. 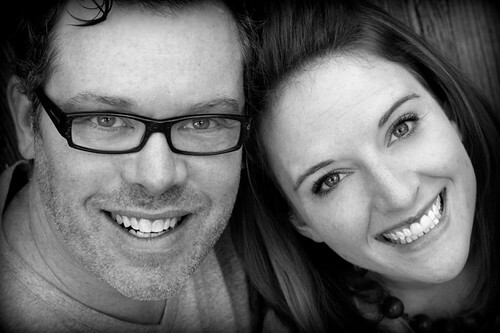 Mrs. Wilsons last blog post..NaBloPoMo Day 3: Beauty or Beast? Holy freakin’ cow, you look fan-TAS-tic!!! And he did everything in only 20 minutes? I couldn’t do it with three hours. So jealous. Jaush, I love you. Call me. Bring the make-up. oh his stash is yummy. much better than all of my cousins (and I only had 6….in my graduating class. Like 50 total). Wow… my cousins are good… but not that good. You look stunning! Congrats on the calendar! Woohooo! Congrats on the bump up and hello gawgeous!!! What a fabulous cousin. That’s a serious makeup kit there mah deah. Very cool, I am totally jealous of your most awesome cousin. Domestic Extraordinaires last blog post..Can I be a Winner Twice in One Week? Is your cousin, by any chance, looking for a best friend? Jaush is a neat name. Is it pronounced the same as Josh? Megs last blog post..Holy Shnoodles. Oh so jealous! I saw that twitterpic the other night… but didn’t know this was the reason! Congrats on making the calendar… as if you weren’t famous already! I think I might buy this calendar. You look stunning! I need a cousin Jaush to magically appear every weekday morning at 6:30 am and make me look like THAT…. You look stunning. I think everyone needs a cousin Jaush, but I’m glad he’s yours. Ok, I confess I lied before. I’m totally hitting on you. In a mostly platonic hetero way. But I’ll let you know if that changes. You are soo pretty, maybe someone will put you on T.V…. You’re in??? Yay! That’s all kinds of awesomeness! My cousin used to be a stripper, may be she can make me into an exhibitionist who loves to dance, though I’d settle for just a touch of rhythm. Colleen – Mommy Always Winss last blog post..What, me worry? Gawd, you’re so damn gorgeous. Sarcastic Moms last blog post..Lunch with Uncle Randy, No farting. what a gloriously beautiful picture!! Congrats on the calendar – there is no default winning, you should definitely be there! I’m sharing a “I love your blog” award with you, your stories make me laugh and cry. I posted more details on my page. MAC makeup is the ****. my bff lindsay works for MAC. i get free stuff all the time which i heart. OMG! 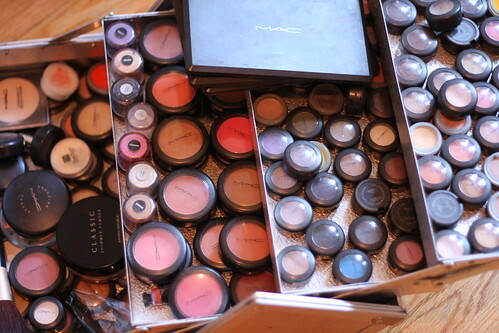 It is my DREAM to go to the MAC counter and buy their biggest, shiniest train case and fill it with one of everything! I’m SO jealous right now my eyes are turning green. You look fab! Meanwhile you regret hanging out with me because when you worn slippers fall from the sky and rain gutters spew bedazzled jean jackets. Does Jaush do housecalls? To Canada? Assertagirls last blog post..Calling all fashionistas. Holy cow, you do have the most awesome cousin. However if my cousins read this I will deny it. I had to click over from twitter to see what the deal was with that picture it is stunning.